SIC: The Standard Industrial Classification (SIC) system was originally developed in the 1930’s to classify establishments by the type of activity in which they are primarily engaged. The purpose of this task was to promote the comparability of establishment data to describe the US and Canadian Economies. The SIC has not been updated since 1987, however, the SIC system is still widely used. Some companies, such as D&B, have created their own 4 digit extension to the original SIC system as a means to update and expand the system so their Customers can more precisely define their Business Classification. 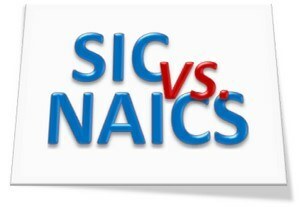 NAICS: The North American Industry Classification System (NAICS) was established in 1997 to replace the no longer sufficient SIC system. Developed in coordination with the statistical agencies of Canada and Mexico, NAICS (pronounced ‘nakes’) establishes a North American Standard that allows for a high level of comparability in business statistics among the three countries. It is the first economic classification system to be constructed based on a single economic concept. How Do NAICS & SIC Codes Relate to My Marketing Initiatives? The first and most obvious use of NAICS & SIC codes is that they allow you to target your marketing to specific industries. With the help of NAICS Association, you can acquire a Targeted Marketing List by NAICS & SIC that can be laser targeted to suit your needs. You may want to know who your ideal customer is. By Appending NAICS & SIC Code Information to your Existing Customer Database, you can determine which industries best represent your ideal customers. By evaluating your most frequent and high paying customers, you can implement strategies to retain your best customers and find more like them. Did you know that similar Types of Businesses will have similar types of NAICS Codes? For Example, if you know that you do well with Companies with the NAICS code 236116: New Multifamily Housing Construction, you may want to look at the Two Digit Code 23: Construction. A two digit code allows you to look at all related 6 digit Codes in an industry. You may find new opportunities such as 236117 New Housing For-Sale Builders and 236115: New Single-Family Housing Construction. Learning to navigate the NAICS structure can open new doors to great prospects and sales leads. Click to see the Comprehensive Lists of SIC Codes here or NAICS Codes here.